Gavin08 wrote: I recieved this today. It's from Liverpool fc but i'm not sure who from. And many more just can't think! I got some of IP from Premier League. First of eleven autographs are probably all of Tottenham (vs. Swindon this holidays). Rest is from all Premier League Last one is probably of Bolton. Can you help? Please! Anyone familiar with Streep......got 2 and both seem quite legit to me among the sea of fakes. I send out quite a few letters to celebrities/footballers recently and I have happily received one back but all that was inside the envelope was a signed index card. On the envelope was just a first class stamp so I couldnt even see where it had been posted from. nikkif99uk wrote: cataloging my collection and found a few more I can't remember. I often wrote to every single cast member of my favourite films and TV shows including the bit parts. I received this autograph and am embarrassed to say that I don't know who it is! I am new to this autograph collecting hobby. I only included my husband's name (Kipp) in a few requests, but I still can't narrow it down. It was postmarked Los Angeles. Any ideas? Last edited by Strawberry72 on Sat Nov 30, 2013 12:06 pm, edited 1 time in total. Your link doesn't seem to be working for me. Maybe you can try posting a picture using Photobucket.com? 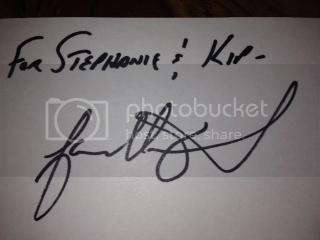 Strawberry72 wrote: I received this autograph and am embarrassed to say that I don't know who it is! I am new to this autograph collecting hobby. I only included my husband's name (Kipp) in a few requests, but I still can't narrow it down. It was postmarked Los Angeles. Any ideas?